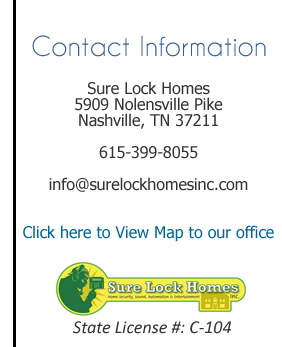 Sure Lock Homes of Nashville was founded as the go-to company for homeowners who want quality home security needs. Over the years we have grown to now include home audio and home video installation and setup, as well as home automation services, allowing homeowners to control almost any aspect of their home remotely. Customer service has always been our top priority. We strive for perfection with everything that we do to ensure that you get everything that you desire. Our highly trained staff is the best in town, you can always count on Sure Lock Homes for the best quality of products that we install as well as the best service available. Contact us today to discuss any of your home needs, from home security, home audio, home video, or home automation needs. We will meet with you, go over in detail all of your options, and give you not only the best price available, but also the best service possible.